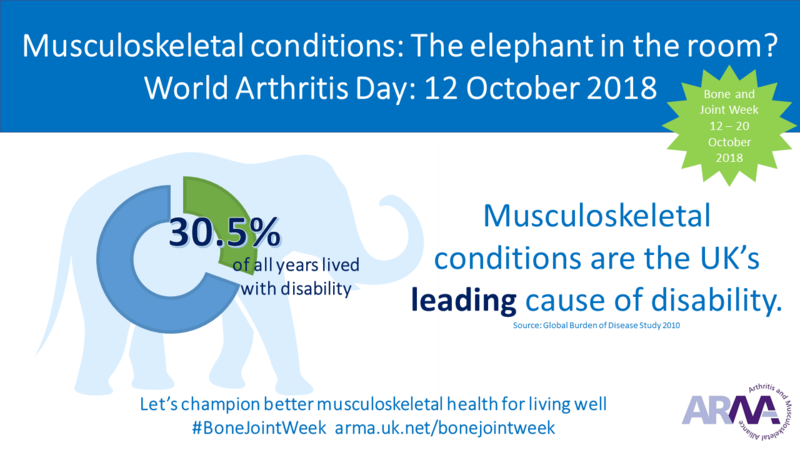 Musculoskeletal conditions: the elephant in the room? 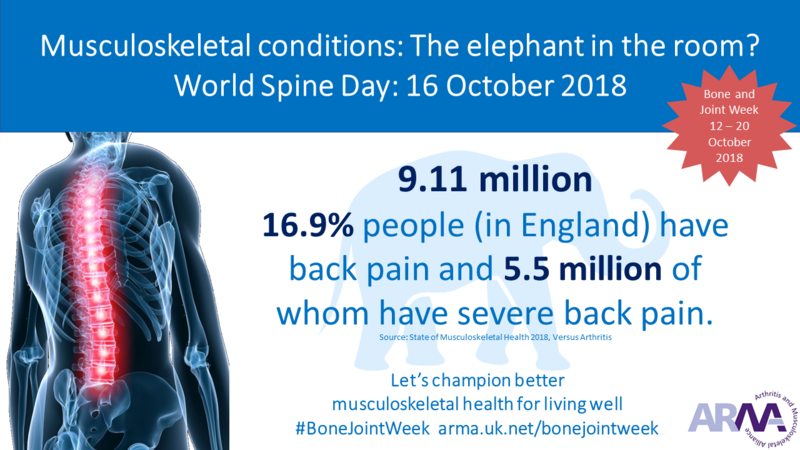 Conditions of the bones, joints and muscles are a big problem in the UK; with over 17 million people living with a musculoskeletal condition, more people suffer with disability from musculoskeletal conditions than anything else. Good health of bones, joints and muscles underpins living life well. Musculoskeletal conditions affect nearly everyone at some point in their life. They can cause pain, fatigue, restricted mobility and activities of daily living. They impact people’s lives, their work and even people’s other health conditions. 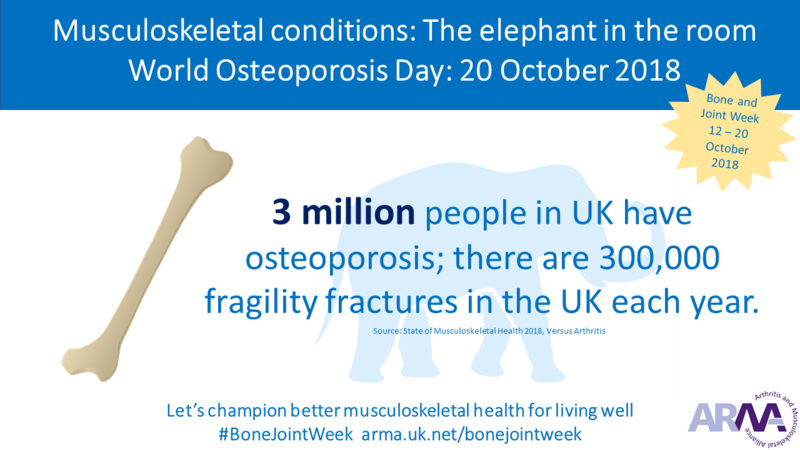 Conditions of the bones, joints and muscles represent a significant cost to the individual, the economy and health and social care. Everyone knows conditions like arthritis and back pain are common. But they are often misunderstood and ignored, like the figurative elephant in the room. The solution begins in acknowledging the problem. That’s why we need to shift our mindset and start planning and acting nationally, locally and individually for healthy bones, joints and muscles throughout life. 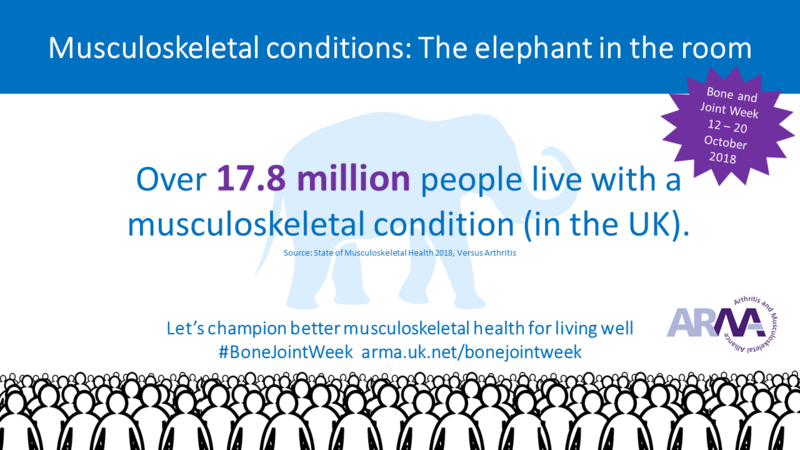 If we’re brave enough to tackle this big and growing problem, to champion lifelong good musculoskeletal health, there are large rewards, helping people to live well, saving money in the NHS and UK economy. 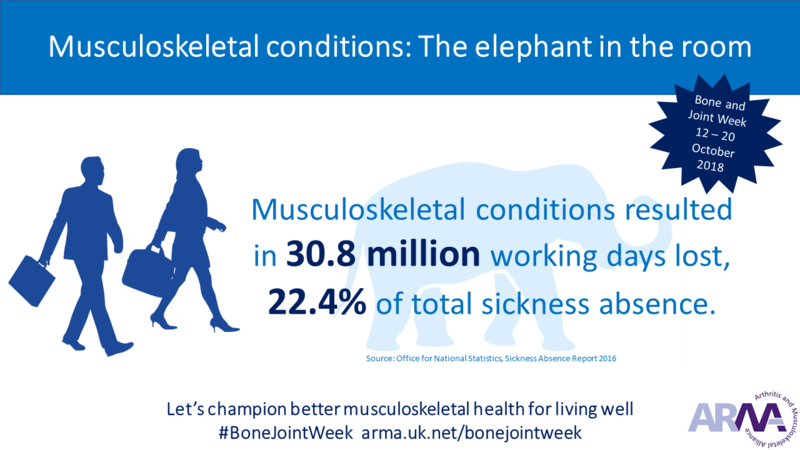 That’s why charities, professional bodies and research organisations in the musculoskeletal community have joined forces over Bone and Joint Week 2018. 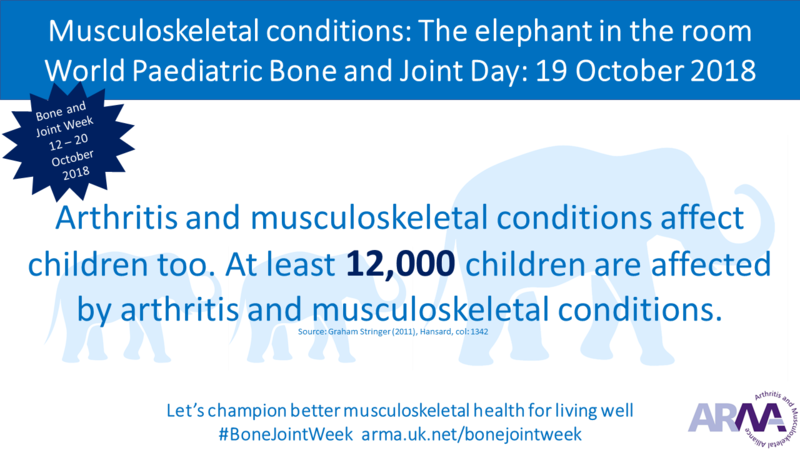 Find out more about this campaign on Twitter @WeareARMA #BoneJointWeek and take a look at the campaigns our members are undertaking. 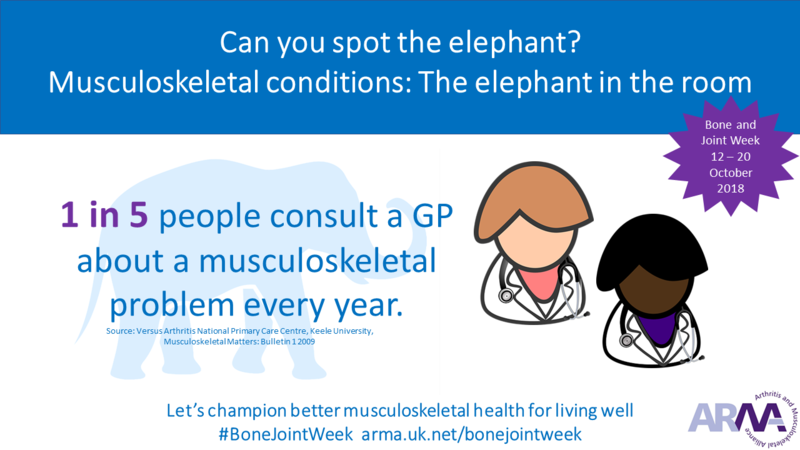 Versus Arthritis: During Bone and Joint Week Versus Arthritis are urging people to share their Room to Manoeuvre report with their MP. 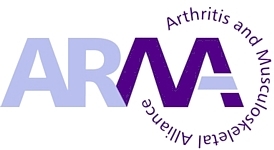 Aids and adaptations in the home can help people with arthritis maintain their independence, but Versus Arthritis research has uncovered that people with arthritis often don’t receive the support they are entitled to. They found out that many people don’t know that aids and adaptations exist, let alone that they could be funded by their local authority. More information is available on their website. 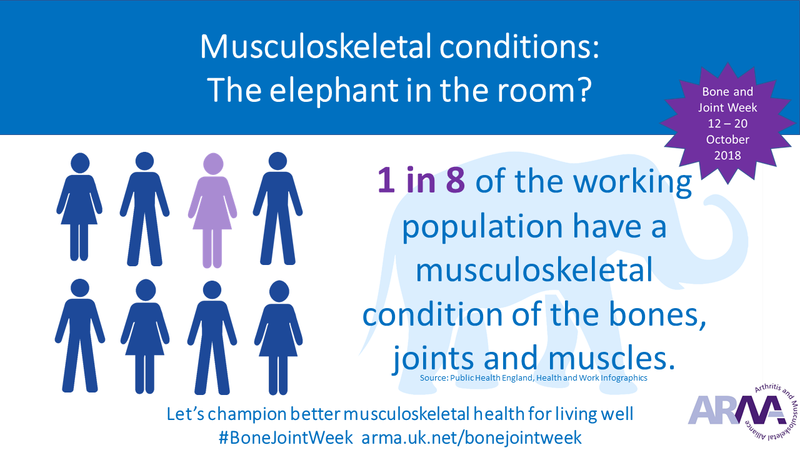 Bone and Joint Week 2018 is part of an international campaign to improve musculoskeletal health. Learn more about ARMA’s international network.